Kitchen Renovation, Part 2: Let the Planning Begin! About three months ago (has it been that long!? ), I began my kitchen renovation by removing some upper cabinets. 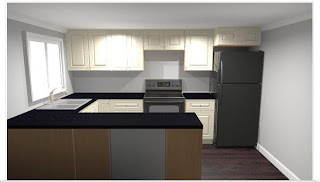 Though that process nicely opened up the space, it also made the remaining ugly cabinets more visible. I planned to make some inexpensive cosmetic fixes until I could completely gut and renovate the space. But I hit some snags. First, my experiments with painting the cabinets failed. They're finished in some kind of oil-based (seems like kryptonite-based) clearcoat, and the primers and paints I have on hand will not stick. I'd have to strip the finish first, then paint. :( I don't like using chemical strippers. 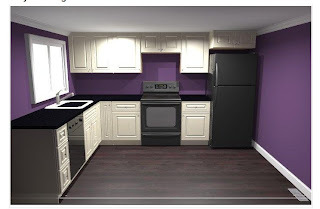 And the cabinets are so poorly made, they're hardly worth the effort. Second, the garbage disposal side of my sink began to leak. The disposal -- which shakes the entire cabinet and operates at the decibel level of a 747 -- has long been in need of replacement, but I'm not keen on installing a new garbage disposal on the crappy old sink. I don't want to spend the next year putting time and money into a continuous series of patches to a kitchen that will eventually be gutted. I think my better course of action is to move ahead with the full kitchen renovation sooner rather than later. First step: Plan the layout. 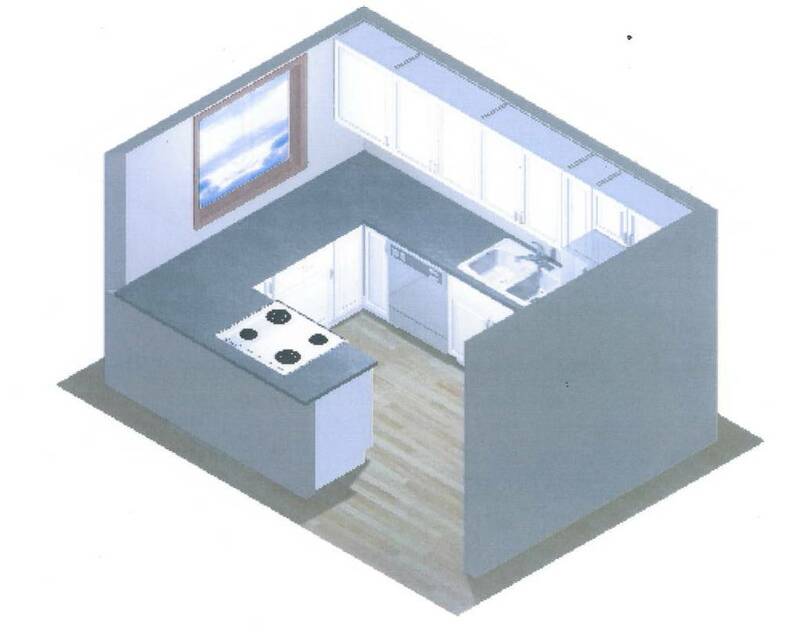 The general footprint of the kitchen is fine, but I don't like having the stove on the peninsula (or the requirement of buying a more-expensive slide-in range). 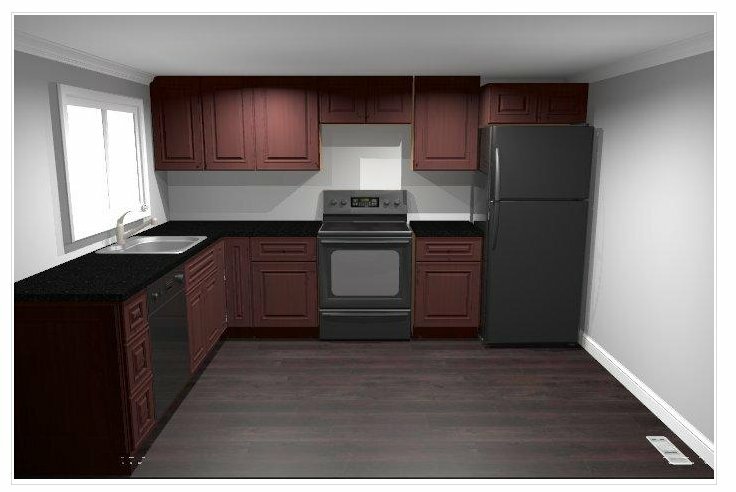 I also think the sink should be under the window. Moving the appliances will require re-routing of plumbing and electrical; the expense of this work is part of the reason I was delaying the remodel. Second step: Plan the cabinetry. There's a huge price range for cabinetry, from relatively inexpensive stock cabinets to somewhat pricey semi-custom to how-many-thousands-of-dollars-did-you-say?! 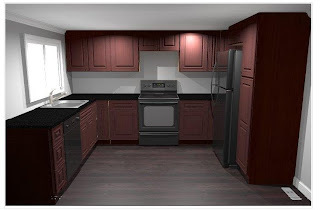 custom cabinetry. I will stick with stock cabinets. 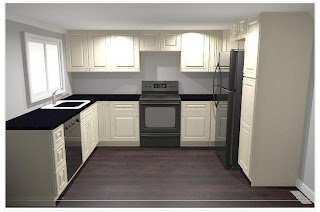 Some of the cabinet companies offer free 3D design tools, which make it easy (and fun!) to determine which sizes and styles work best for you. I like the idea of an ebony stain on the cabinets (it looks dark brown in the renderings), but it might make the kitchen too dark. 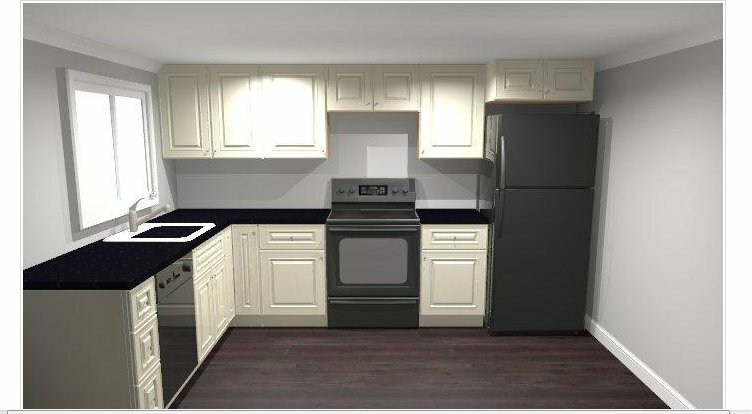 White cabinets would keep it brighter. Of course, I could also change the wall color. Many of you sent good wishes for my dog Bean Sidhe’s eye problems -- thank you all again for that -- so I thought I'd give a quick update on our visit to the veterinary ophthalmologist. I wasn't seeing any improvement in the ulcer. Then on Monday, I noticed her eye was beginning to look red. I didn't know if that was bad or good. It looked sort of scary. I was afraid that I’d get bad news from the vet. but I'm not attached to that particular car. I'd be just as happy with a similar car. It's the same with my New Rock boots, my bat soap dispenser, my purple toaster... while I would be disappointed if they were lost, I'd be just as happy with a new pair of boots, another bat soap dispenser, a new toaster. What would I take if my house were on fire? I'd grab my dog, of course, and my "go bag," which contains the practical things that would be hardest to replace - documents such as my birth certificate along with a portable hard drive backup of all my music, photos, etc. If zombies were on the way, I'd get my go bag, throw in my purse, and the dog and I would be outta here. How can I have a house full of stuff but no prized possessions? I simply don't get attached to things. It's not a choice, it's just my nature. In fact, I have trouble getting attached even when I want to. How much stuff is too much? The answer varies by person. Some people are most comfortable in a Spartan environment. Some people love to surround themselves with treasures. So if there's no specific threshold, when does "stuff" turn into "clutter"? In my opinion, stuff becomes clutter when it becomes a burden; when it negatively impacts your life. When you constantly waste time searching for things, when you spend your holiday worrying that someone will break in and steal your stuff, when you avoid having friends over because you're embarrassed by your house... you have clutter. I look forward to seeing other people's prized possessions and reading the stories behind them. :-) Thanks for the challenging yet fun assignment, Le Professeur Gothique! One of my strengths, and part of what I like to feature on GIY, is creative problem solving. I can usually find a solution to most problems. But when I can't find a way to fix something, I get frustrated. When that "something" is my pet, the frustration is compounded and intensified with worry. I've been remiss in posting lately because I've been caring for (and worrying about) my dog Bean Sidhe. On Saturday morning two weeks ago, I saw her pawing at her right eye. This put me into a slight panic because (1) a year ago, she needed surgery for an ulcer on her left eye and (2) she is deaf, and the thought of her losing her eyesight terrifies me. Within an hour, we were at the emergency vet clinic. The vet applied a drop of topical anesthetic and then used fluorescein stain to check for corneal damage. Bean Sidhe's entire eye stained green, indicating a very large eye ulcer. :( The vet recommended an aggressive course of treatment: two types of antibiotic drops, atropine drops and Remend drops, plus an oral pain medication. All weekend, I put drops in Bean Sidhe's eye every two hours. Her patience and my new alarm clock were thoroughly tested. On Monday, we went to an every-six-hours routine. I had to get up in the middle of the night and I had to drive home from work in the middle of the day (38 miles round-trip). Despite the aggressive treatment, Bean Sidhe's eye wasn't healing well. The following Monday, she had surgery to remove the nonhealing tissue (superficial keratectomy). Conveniently, dogs have a third eyelid which can be pulled over the eye to protect it while it heals. The eyelid is held in place with a stitch, which in turn is held in place with a button. That's right, a button like you'd find on a shirt. "Hey! Get this thing off me!" Poor Bean Sidhe. The collar itself didn't bother her much, but the limited vision combined with her deafness made her insecure. She wanted to be with me ALL the time. Several more days of waking up in the middle of the night and driving home mid-day, and it was back to the vet on Friday for the stitch to come out. To my great disappointment, staining showed that the eye had only partially healed. :( She's still in the E collar and her eye is still bothering her. I'm exhausted, frustrated and worried. I see that she hurts, and I wish more than anything that I could make it better. It's fun to look at a little retrospective of the changes over time. The house looked like this in May 2010, a few months after I purchased it. Only the garage door had been replaced. The yard has been sadly neglected, partly because I've concentrated on spiffing up the exterior of the house and partly because I was so overwhelmed with the desperate state of the yard that I didn't know where to start. I was rescued by a wonderful co-worker, who has generously given me her time and advice, as well as free plants from her garden. I am so grateful! :) Yesterday, she and her son planted a little tree for me as the first step in bringing life back to my grave yard (pun intended).